Teenage Mutant Ninja Turtles - Into Dimension X! When the daughter of the Governor of California (Joel Gretsch) is targeted by custom-made viruses assaulting both her computer and her biology, Walter (Elyes Gabel) and his team are brought in to find the bio-hacker before the sick young girl takes a turn for the worse. 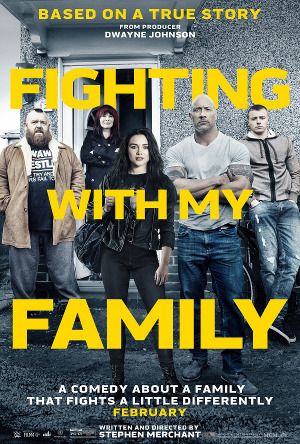 Paige (Katharine McPhee) isn't alone in seeing how the sick girl's plight effects Walter which forces the genius to open up about his sister (Emily Robinson, Camille Guaty) whose lifelong battle with MS is one problem Walter has never been able to solve. Fretting about throwing out the first pitch at an Angels game, Howard (Simon Helberg) enlists the help of Bernadette (Melissa Rauch) and Raj (Kunal Nayyar) in an attempt not to make a complete fool out of himself. Despite all the practice he can stand, Howard is forced to admit his shortcomings. His out-of-the-box solution, while novel, doesn't exactly endear him to the fans. 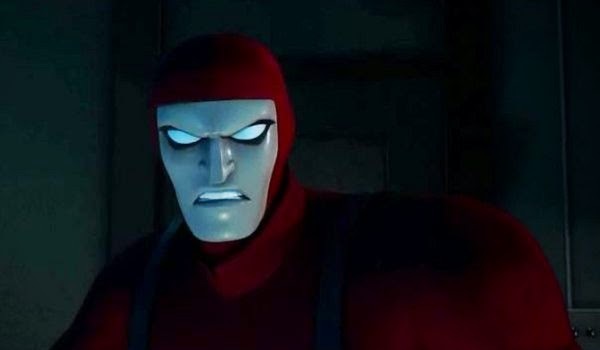 Bringing the Golden and Silver Age character to the Beware the Batman universe while putting its own spin on his story, "Unique" introduces Manhunter (Xander Berkeley), a government agent kept in suspended animation for 20 years while evil scientist Dr. Anatol Mykros and his shadow organization known only as The Council have created an army of cloned automatons from his DNA. While Regina (Lana Parrilla) is tempted down a dark path dealing with Emma's (Jennifer Morrison) choice to bring Robin's (Sean Maguire) long-lost wife back in time with her from the past, the rest of Storybrooke has to deal with the other unforeseen consequence of Emma and Hook's time-travel when Storybrooke gets a new visitor. 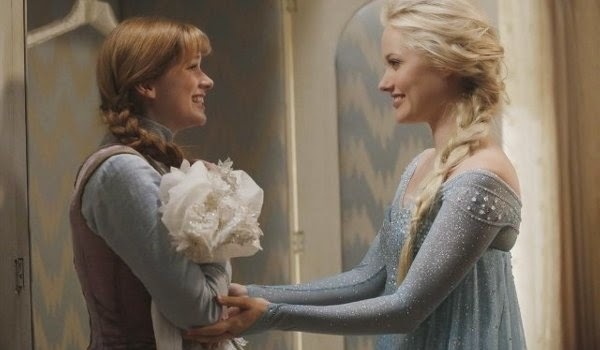 Although Regina's tale takes up a good portion of the season premiere, most of "A Tale of Two Sisters" deals with Elsa's (Georgina Haig) arrival in Storybrooke and the flashbacks with the Ice Queen and her sister Anna (Elizabeth Lail) explaining why Elsa walked through the door which Emma opened. With Katana (Sumalee Montano) attempting to stand-in for Batman (Anthony Ruivivar), Bruce Wayne takes some time off getting to know Harvey Dent (Christopher McDonald) and his head of security. 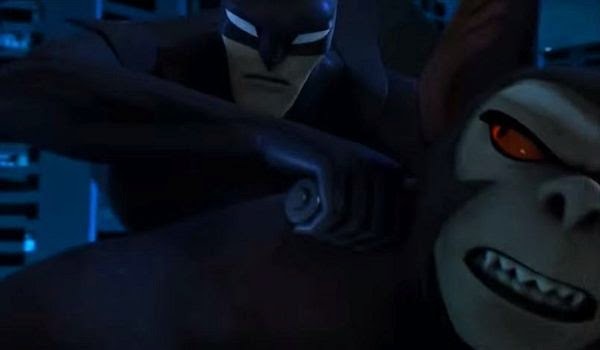 After encountering Man-Bat (Robin Atkin Downes) for the first time, however, Bruce doesn't waste any time in donning the cape and cowl and hitting the streets with Katana to find out who the new Bat-creature prowling the night of Gotham is. 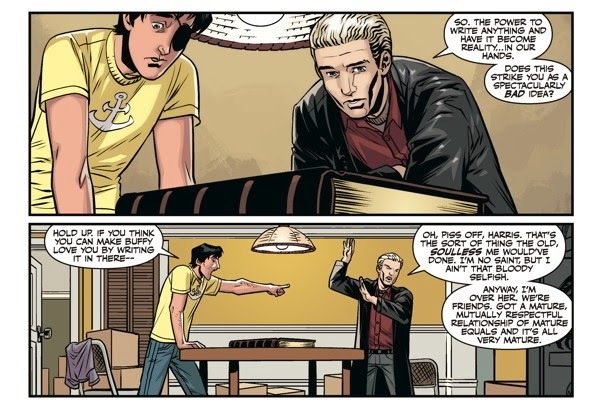 After taking a month off, Nicholas Brendon returns to co-write the latest issue of Buffy Season Ten which continues the fresh start for the comic's core characters and new living accommodations for roomies Spike and Xander. Continuing the theme of temptation, the latest issue sets Spike and Xander at the mercy of Sirens who nearly devour the pair if not for the timely intervention of ghost Anya screaming some sense into her ex-fiance. Clara's (Jenna Coleman) worlds collide when The Doctor (Peter Capaldi) shows up as her school's new caretaker forcing Clara to apologize and make excuses to and for both men in her life. 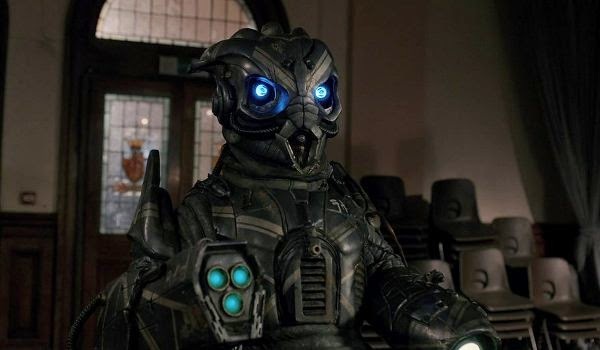 While not dealing with the deadly killing machine known as a Skovox Blitzer, The Doctor spends most of the episode insulting Danny Pink (Samuel Anderson) who he cannot see as anything more than a soldier (which Danny hasn't been for some time) and P.E. teacher (something he's never been). 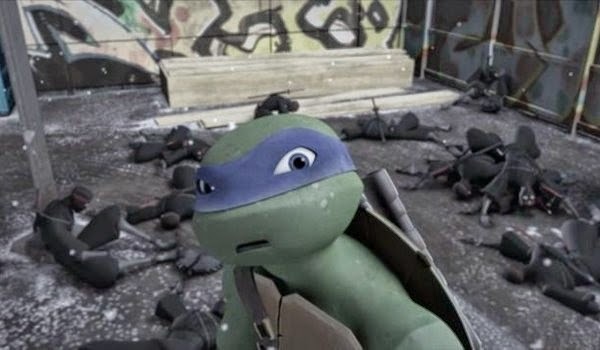 The Second Season finale of Teenage Mutant Ninja Turtles is rather bleak for our heroes in a half-shell. 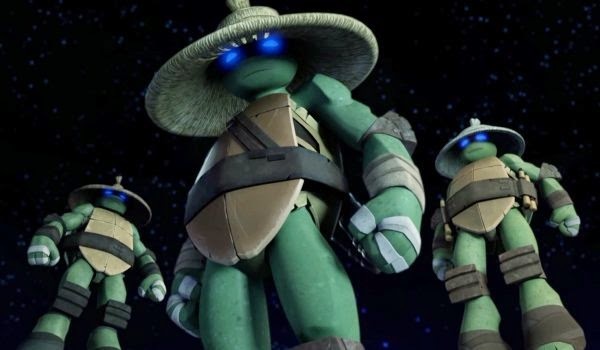 Perfecting the Mutagen, agreeing to a partnership with the Shredder (Kevin Michael Richardson) and his Foot Clan, and using Irma (Kate Micucci) to discover the secret location of the Turtles' home deep inside the New York sewers, the Kraang's invasion of the city begins as the aliens start transforming New York into another Dimension X. 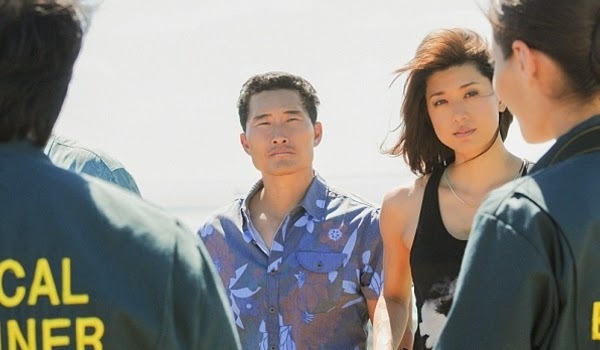 Returning for its Fifth Season, the season premiere of Hawaii Five-0 sends the team after a weaponized domestic drone hijacked and used for a series of brutal attacks on the main island. Calling on the services of Jerry Ortega (Jorge Garcia), McGarrett (Alex O'Loughlin) and Danny (Scott Caan) track down the company who was hired by the U.S. Government to build the drone but has now lost it to a group whose attacks on civilians have a hidden second purpose behind the terrorist attacks. 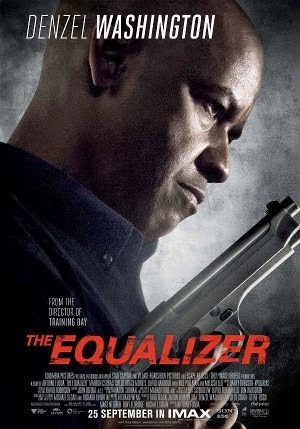 Based on the 80s television show of the same name, The Equalizer stars Denzel Washington as a retired military officer with a mysterious past attempting to live a normal life. That normalcy is shattered when an acquaintance (Chloë Grace Moretz) is hospitalized by her pimp (David Meunier) sending Robert McCall in search of justice which will lead him on a one man crusade against crooked cops and the Russian mob. Washington feels a bit out of place here in a script by Richard Wenk more befitting Steven Seagal in the prime of his B-movie action days. Unsure at times whether it wants to be a drama or old school action/revenge flick, The Equalizer is at its best when it allows McCall to take off the gloves and get to work (such as the movie's climactic sequence involving several inventive deaths using various implements at the Home Depot where McCall is currently employed). Set three months after the events of the show's Ninth Season finale, Booth (David Boreanaz) remains in prison for the death of three FBI agents. On the outside Bones (Emily Deschanel) gathers the Jeffersonian team to look into a 16 year-old murder in hopes of unraveling the conspiracy inside the FBI. Hodgins (T.J Thyne), Clark (Eugene Byrd), and Cam (Tamara Taylor) have their hands full when they discover someone to great pains to make it incredibly difficult to gather any new useful information about the remains should they ever be exhumed. Fearing for her husband's safety in the prison, Bones also takes it upon herself to blackmail the Federal Prosecutor (David Fabrizio) in charge of his case to get Booth sent home before another prison assault leaves Booth with more than just scrapes and bruised ribs. In an attempt to fulfill the final wish of Charles Xavier, the unlikely force of Rachel, Cyclops, and Wolverine go after an Omega-Level Mutant whose knowledge of his immense powers Professor X wiped from his mind. With the professor gone, those memories are returning making the man a potential danger to every living being on the planet. 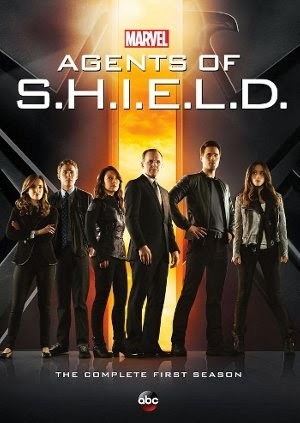 Picking up a few months after the end of last season's finale, Agent Coulson (Clark Gregg) and his team remain fugitives from the United States Government as the new director of S.H.I.E.L.D. 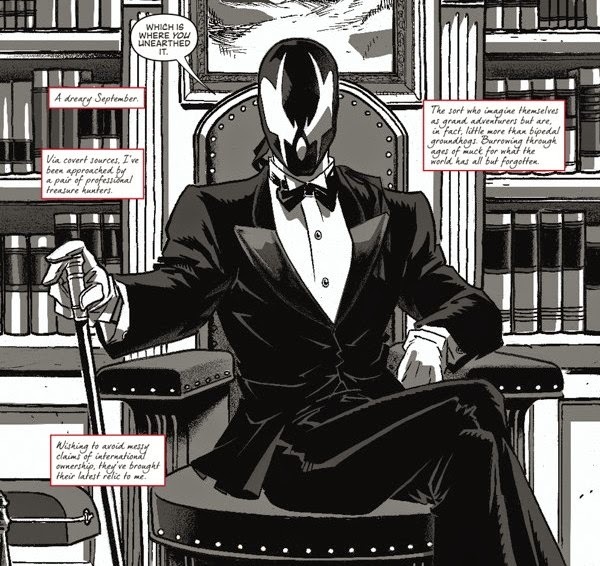 works to slowly rebuild the organization while remaining in the shadows. Since the time we'd seen them last May (Ming-Na Wen) has taken Skye (Chloe Bennet) under her wing to complete the agent's training, Simmons (Elizabeth Henstridge) has left the team although the injured Fitz (Iain De Caestecker) still hallucinates conversations with her while trying desperately to communicate and complete his assignment which he could have accomplished far more easily before his brain damage. Picture Rizzoli & Isles mashed-up with Highlander (without the head-chopping). 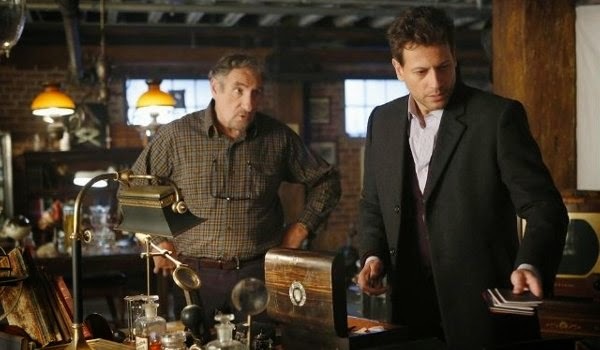 Ioan Gruffudd stars as immortal doctor Henry Morgan currently working as medical examiner for the New York City Police Department. 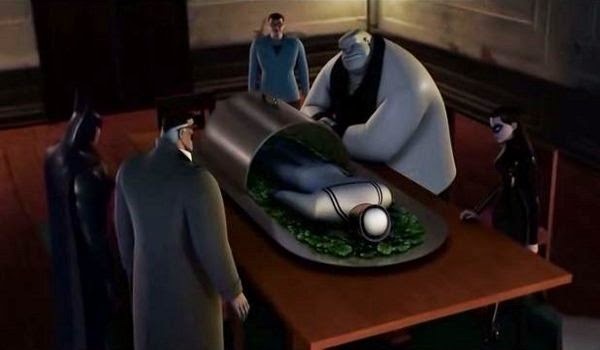 Every time the doctor dies his body magically disappears from the scene only to reawake in the middle of the Hudson River. Using his extensive medical knowledge about death, while hiding the truth about his condition from everyone in the world except an old man (Judd Hirsch) he raised from infancy, Dr. Morgan uses his experience to help solve crimes. 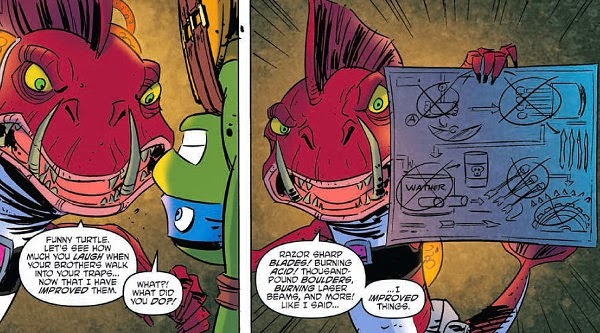 Leonardo's planned competition for the rest of the team gets out-of-hand when the Turtles' leader is captured by Fishface who alters the various challenges and traps in Leo's obstacle course to lethal levels in hopes of finishing Donatello, Michelangelo, and Raphael once and for all. 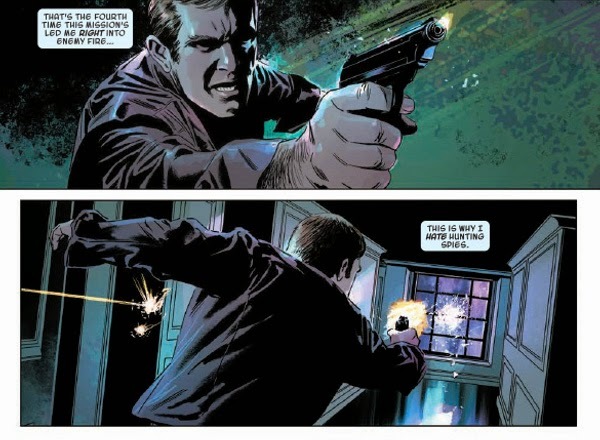 The comic's main story forces the competition into a team-building exercise (which Leo had in mind all along - although be it far more dangerous than he planned). 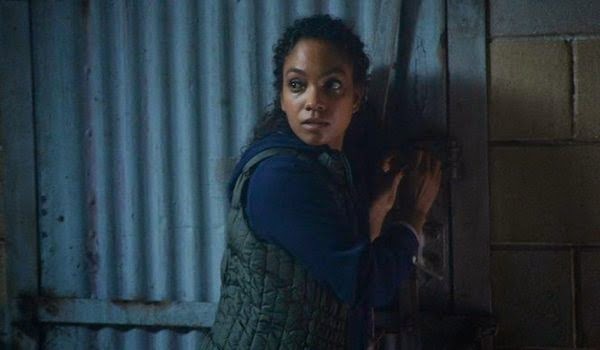 After spending the first-third of the episode on a fake reality used by Moloch to lower the defenses and force Ichabod Crane (Tom Mison) and Abbie (Nicole Beharie) into revealing information about an artifact the demon needs to lead his army into the Earth, the season finale picks up in earnest with Ichabod breaking out of his casket, reuniting with Jenny (Lyndie Greenwood), and working together to stop the plans of Moloch and the Sin Eater (John Noble). After living new lives provided by The Machine for weeks the team finally receives a new number. In his role as a narcotics officer, Reese (Jim Caviezel) joins Fusco (Kevin Chapman) to look into an Egyptian immigrant (Navid Negahban) forced to work for a small-time criminal organization needing the man's skills to create a computer network safe from Samaritan's watching eyes in time for the biggest heroin shipment of the year. The group's pressure, and Reese's intervention, put the man's teenage son in danger leading to Reese deciding to make several questionable decisions including enlisting the help of Elias (Enrico Colantoni). With the season premiere returning Sheldon home and introducing a new career for Penny (Kaley Cuoco), "The Junior Professor Solution" deals with the leftover fallout from last season's finale and Penny's future in pharmaceutical sales. Sheldon (Jim Parsons) returns to the university still dead set against continuing his study of String Theory. 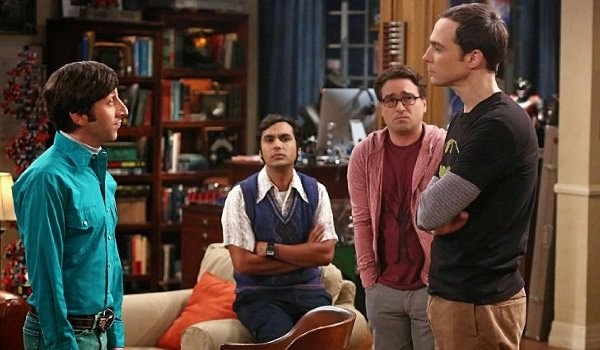 Much to Sheldon's surprise, the university offers the scientist more money and a way to choose a new field of study but only if Sheldon agrees to become a junior professor and teach a class. Wrapping up the two-issue arc begun last month, Astro City #15 reveals the history of Eleanor Jennersen and how the leading mind behind robotics became the owner of a robot scrap yard in the middle of nowhere. Pulled before a judge for the crimes caused by the robots her nephew decided to use for a quick profit, Ellie breaks out of prison (thanks to the help of her metal friends) and clears not only her name but those of her rebuilt robots as well by revealing the true threat behind the plot: her old college roommate Vivi Viktor. 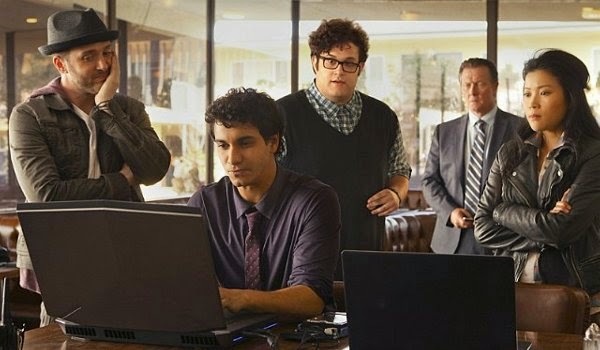 Adapted from the real-life adventures of a computer genius' work with the Federal Government, Scorpion stars Elyes Gabel as one of the five smartest minds on the planet who, along with the team of geniuses (Eddie Kaye Thomas, Jadyn Wong, Ari Stidham) he leads has trouble with emotional reactions and connecting to the wider world. The "Pilot" centers around Walter and his flailing company being hired by his old government handler (Robert Patrick) who needs to team to get the corrupted computers at LAX up and running before planes start falling from the sky in less than two hours. Picking up on the unresolved events of last season's two-part finale, Reddington (James Spader) continues his search for the mysterious Berlin (Peter Stormare) as his enemy reaches close to home and enlists an expert data miner and bounty hunter known as Lord Baltimore (Krysten Ritter) to track down Red's ex-wife (Mary-Louise Parker) who apparently is key to the madman's revenge. Things aren't better for the rest of the task force as Cooper's (Harry Lennix) recovery has him contemplating retirement, Ressler (Diego Klattenhoff) is refusing psychological counseling, and Lizzie's (Megan Boone) life after the death of Tom (Ryan Eggold) has gotten no less complicated. 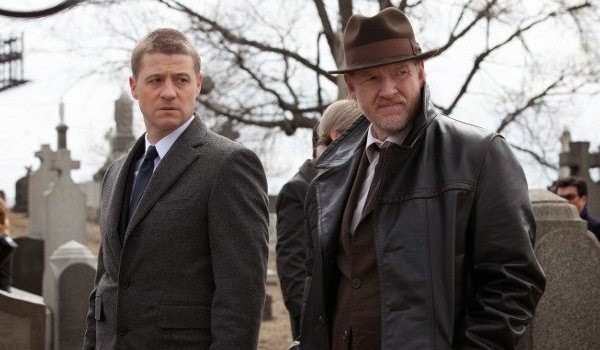 Opening on the worst night of Bruce Wayne's (David Mazouz) life, Detective Harvey Bullock (Donal Logue) and his new partner Jim Gordon (Ben McKenzie) catch the murder case involving the deaths of Gotham's most prominent citizens and the frightened young boy who was one of two witnesses to the crime. Desperately trying to create the grim feel of Christopher Nolan's recent films while featuring writing, acting, and dialogue better fitting a lazy afternoon soap opera than a much ballyhooed new primetime series, the "Pilot" of Gotham is sadly far, far removed from the far more interesting award-winning comic book tales of the GCPD by Ed Brubaker, Greg Rucka, and Michael Lark. 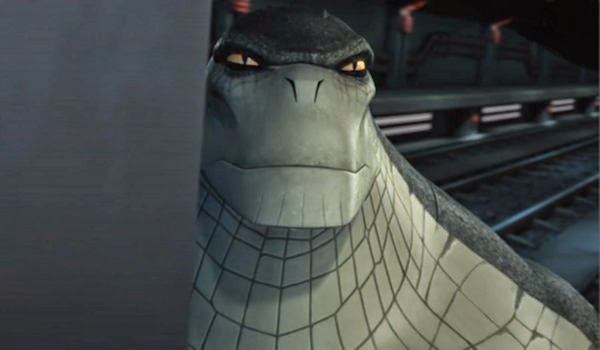 Disney's new animated series Star Wars Rebels is set to premiere on October 3rd with a two-part movie before officially beginning it's First Season run on October 13th. Set five years before the original Star Wars (no, I'm not going to refer to it as "A New Hope"), the series centers around a group of rebels including a former Jedi (Freddie Prinze Jr.), a teenage con artist (Taylor Gray), the ship's muscle (Steve Blum) and pilot (Vanessa Marshall), an explosives expert (Tiya Sircar), and an astromech droid. 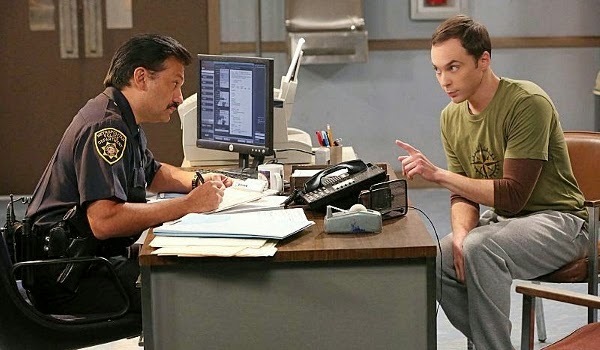 Taking place 45 days after last season's finale which saw Sheldon (Jim Parsons) rebel against change and decide to leave home to ride the rails, "The Locomotion Interruption" finds the scientist at his wits ends after being robbed of his valuables, dignity, and his pants, and forced to call Leonard (Johnny Galecki) for help. Taking Amy (Mayim Bialik) along with him, Leonard drives to Arizona to bring his friend home on what proves to be a pair of uncomfortable car rides both to and from the copper state. 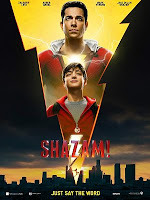 Collected on Blu-ray for the first time, the Second Season set includes not one but two Captain Marvel stories, the classic recreation of the comic story of Batman confronting Joe Chill, a Crisis-inspired tale involving all three Flashes, Aquaman's family vacation, Booster Gold and the Blue Beetle together again, the sidekicks getting their own episode, a Birds of Prey episode written by Gail Simone, a space race between heroes and villains, and Batman being split into three separate personalities (including one who eats nachos). 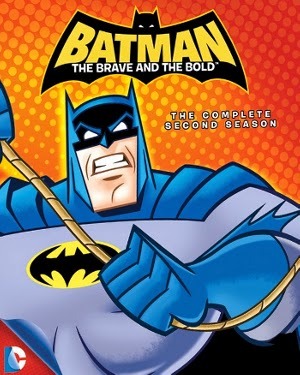 Unless you already own the episodes on DVD, it's an easy recommendation for Bat-fans everywhere. Sadly, the set includes no extras. 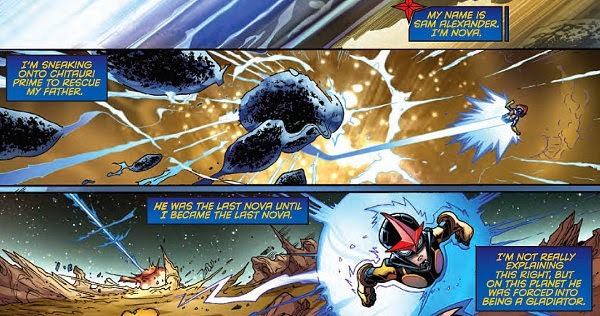 Although his actions will have serious consequences for when he returns home to Earth, Nova takes the day off from school to fly into the heart of the Chitauri Empire and search for his father whom he has learned had been living as a slave forced to battle in the alien race's gladiatorial games. 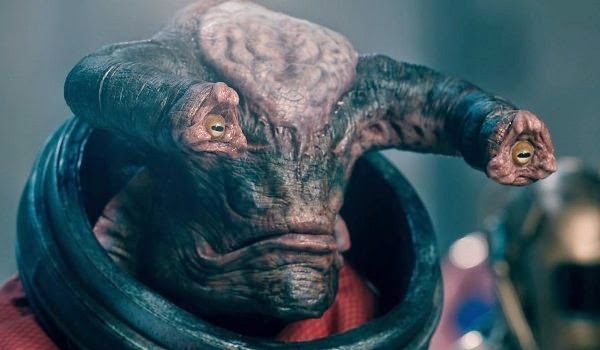 With one of the best pre-credits openings of any Doctor Who episode in recent memory, "Time Heist" finds The Doctor (Peter Capaldi), Clara (Jenna-Louise Coleman), and a pair of professional thieves (Jonathan Bailey, Pippa Bennett-Warner) all awaking after a short-term memory wipe before which they foursome agreed to rob the universe's most impregnable bank. Using the mutant abilities of Saibra (Bennett-Warner) and the hacking skills of Psi (Bailey) the group makes it into the bank, but the further they go the more likely the group is to be caught by the bank's security creature who is able to sense and punish guilt on any being it comes across. 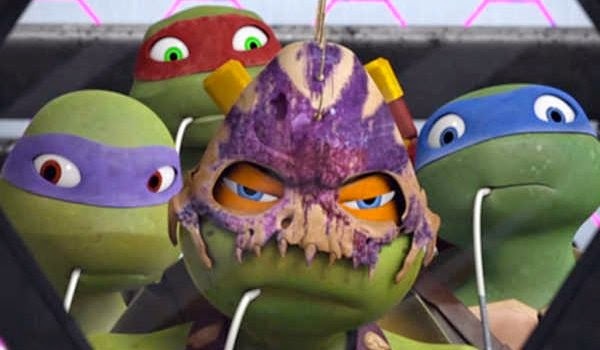 Michelangelo's (Greg Cipes) rash decision to jump through a portal to Dimension X and rescue Leatherhead (Peter Lurie) force Leonardo (Jason Biggs), Donatello (Rob Paulsen), and Raphael (Sean Astin) to follow their brother to a bizarre dimension where Mikey proves to be the most valuable member of the team. Here's Jennifer Lopez with the official video for the remixed version of "Booty" featuring Iggy Azalea. Continuing the adventures began in the Marvel Cinematic Universe, Marvel's Agents of S.H.I.E.L.D. suffers a bit from having to play with last year's toys and deal with the fallout of the planned Marvel feature film releases rather than make any real strides on its own. Thankfully thee release of Thor: The Dark World and especially Captain America: The Winter Soldier bolstered the season's second-half, giving it new life to end the show's First Season on a string of strong episodes. Without question Clark Gregg is the show's star. 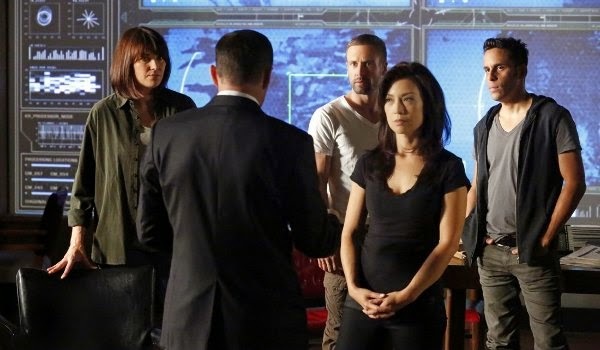 Reprising his role as Agent Phil Coulson, returned from the dead in a mysterious manner (which turns out to be somewhat disappointing once revealed), Coulson puts together his own strike time including two military specialists in Melinda May (Ming-Na Wen) and Grant Ward (Brett Dalton), a pair a bickering scientists (Iain De Caestecker, Elizabeth Henstridge) and a computer hacker (Chloe Bennet) they adopt in the first episode. Throw in an old S.H.I.E.L.D. tricked-out cargo jet, and the team is ready for action. Wow, I have to wonder how bad were the pilots NBC decided to pass on? 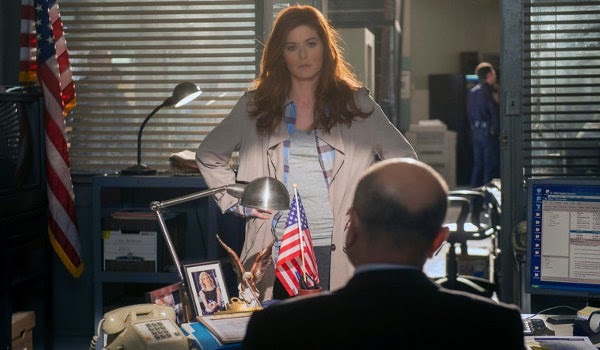 Despite a likable star in Debra Messing and the surprise of Enrico Colantoni in a guest role as the main character's superior officer, the "Pilot" episode of NBC's adaptation of the Spanish television series Los misterios de Laura is awkward in its best moments (which are few and far between). Messing stars as recently separated single mom and Homicide Detective Laura Diamond who apparently will juggle the stress of a cliched version of motherhood involving terror twins (Charles Reina, Vincent Reina) and a doofus husband (Josh Lucas) while attempting to solve the murder of the week. Although it's not his best work, Michael Crichton's 1980 novel Congo is actually a pretty good story. Sadly, the same can't be said for the big screen adaptation made 15 years later. 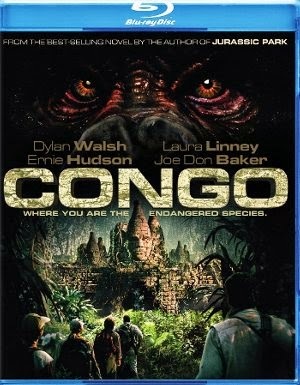 The film stars Dylan Walsh as a scientist who has raised a sign-language speaking ape named Amy and decided to return the gorilla back to the wild with the help of a bizarre financier (Tim Curry) whose interests in the gorilla's doodles make him believe Amy could lead the group to the legendary lost city of Zinj. The movie condenses and jumbles the motives of everyone involved producing a single expedition which also includes a scientist (Laura Linney) looking for her ex-fiancé and his team who were attacked by strange murderous gray gorillas (rather than motivated by the corporate greed of the priceless diamonds lost in the jungle as in the novel), a great white hunter who happens to be black (Ernie Hudson), and a member of the group who you know has no chance to make it out alive (Grant Heslov). 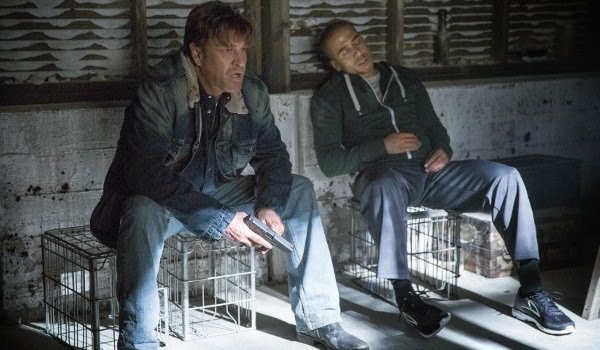 Following the shootout and consequent car wreck, Martin (Sean Bean) and injured Dobson (Kirk Acevedo) find themselves arrested by Houston police and taken to a local hospital. Despite his reservations about the entire situation, Gates (Steve Harris) decides to back Martin's off-book mission and dispatches Crystal (Ali Larter) and Tony Rice (Morris Chestnut) to Houston to discover just what the hell Martin has gotten himself involved in now and track down the military ordinance Dobson's men were in possession of before Martin's intervention. With the set-up of the team settled and the New Warriors victorious over the High Evolutionary I decided to pop back in on this title and give it a look. New Warriors #9 has two things going for it: lots of Scarlet Spider and an insane giant basketball mascot intent on proving himself a hero. This my friends is a good time. 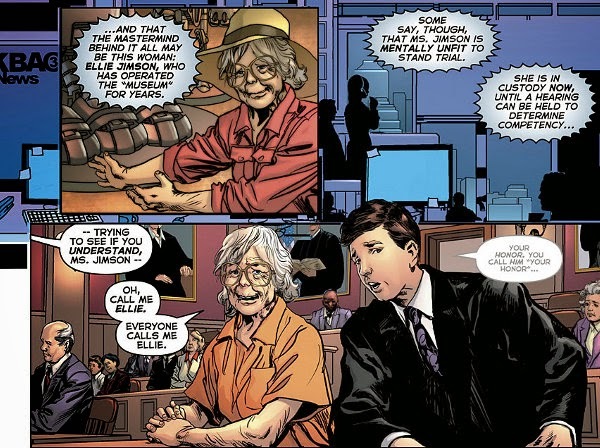 Although she doesn't make an appearance in this issue other than in a flashback, Velvet Tempelton's spirit can be found of every page of the latest issue of Ed Brubaker and Steve Epting's Velvet. Where the previous issues were spent to set-up the premise and the mystery of searching for the truth of what happened to the super-spy turned secretary, Velvet #7 is focused on the woman herself and how she's viewed by the two men leading the search to find her. Even if, for the first time, we aren't seeing the world from her perspective, the latest issue arguably offers readers the clearest picture of the character yet. After three foolish Purple Dragons release the spirit of an ancient Chinese sorcerer from a dagger they find themselves with an immediate power upgrade with control of lighting, thunder, and wind. 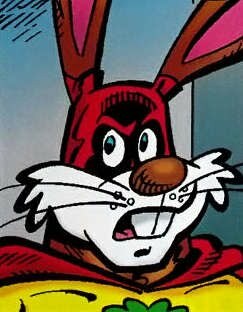 Donatello (Rob Paulsen) and Casey Jones (Josh Peck) are forced to put the rivalry over April's (Mae Whitman) affections aside when Ho Chan (James Hong) chooses to dump the three idiots in favor of his new mindless soldiers: Leonardo (Jason Biggs), Michelangelo (Greg Cipes), and Raphael (Sean Astin). 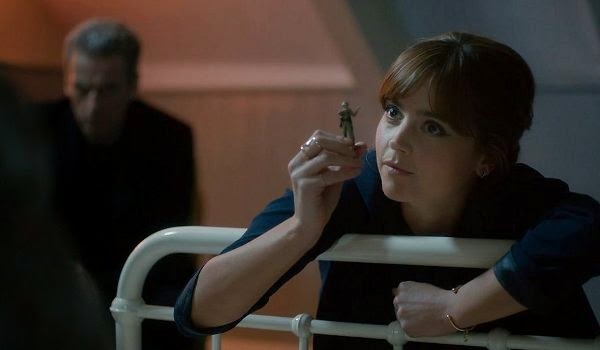 The Doctor (Peter Capaldi) enlists the help of Clara (Jenna-Louise Coleman) to test a theory that no one is ever alone. Given the nature of the universe, The Doctor believes that some unseen creature has perfected the ability to hide and observe unseen. It is this creature whom you are addressing to when you thing you are talking to yourself. 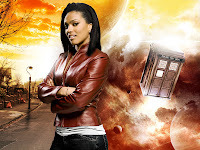 Their journey is complicated when Clara throws the TARDIS off-course by reflecting on her bad first date with Danny (Samuel Anderson) leading her to meet the man as a scared young boy (Remi Gooding) decades before as well as Danny's great-grandson, a time traveler lost at the end of the universe. 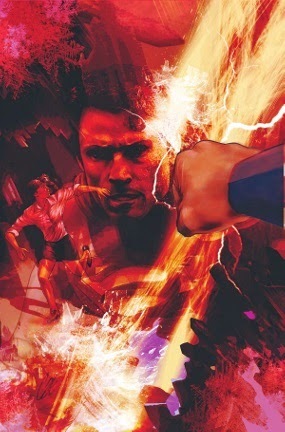 The second issue of Smallville: Chaos focuses on the misadventures of Lois Lane and Superman dealing with being trapped on a parallel Earth under control of the Manhunters while back home Lex Luthor capitalizes on the Man of Steel's absence to put his plan into action. The storyline involving Eclipso continues as well, but it's not given much space to develop and feels somewhat neglected given the focus on various other storylines happening here. We do get more of Booster Gold in action, stepping in to be the hero of the hour in Superman's absence along with Hank Henshaw (although neither appears ready to step into Superman's shoes just yet). 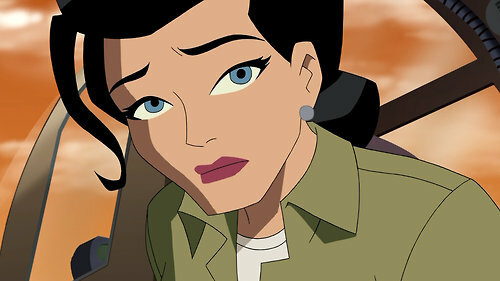 Sadly don't get more of Zatanna this time around. 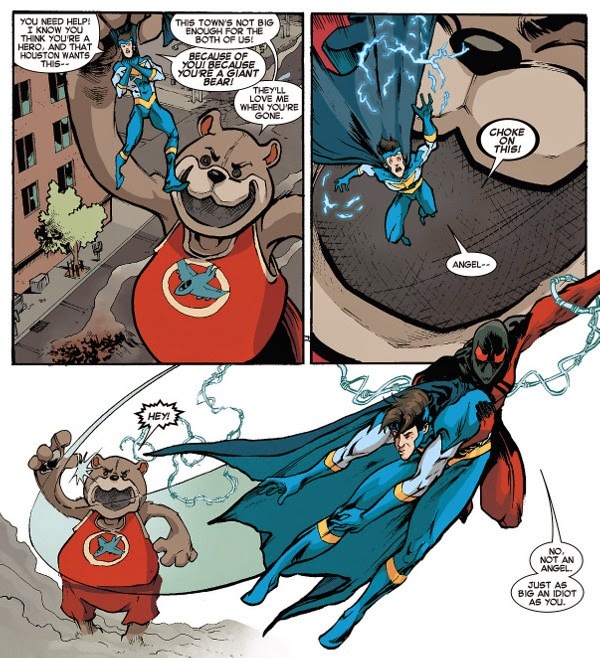 The main takeaway from Smallville Season Eleven: Chaos #2 seems to be that no matter what Earth Superman may find himself living on, his dead computerized father is still a giant jerk. For fans. The return of Humpty Dumpty (Matt L. Jones) isn't pleasant for Batman (Anthony Ruivivar), Katana (Sumalee Montano), Gordon (Kurtwood Smith), Mayor Grange (CCH Pounder), or Tobias Whale (Michael-Leon Wooley), all of whom awake to find themselves kidnapped and trapped in the middle of some diabolic game involving a murder mystery and plenty of traps and twists for each of the participants to solve. 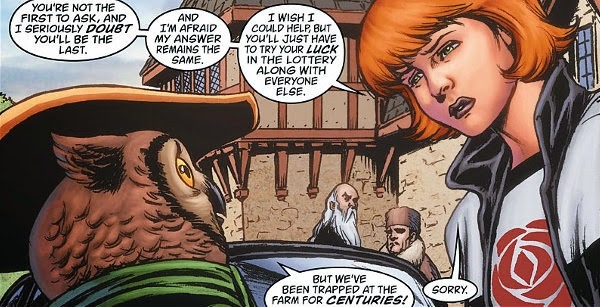 The latest issue of Fairest splits its attention continuing to examine Reynard's misadventures with the angry family of the beautiful farm girl he bedded in their barn (who may not be quite as much of Deliverance cliches as the previous issue suggested) and the continued clamor of the various Fables of The Farm over the five available glamours which will soon be up for grabs in the coming lottery. 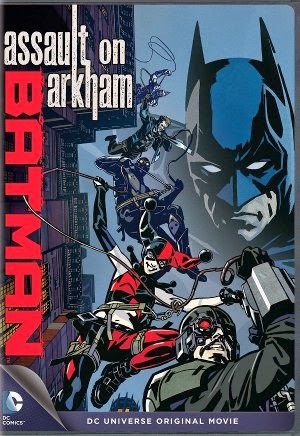 Purposely made to resemble the look and tone of the Arkham Asylum video games (which are more fun to play than watch) and featuring the New 52 version of the Suicide Squad (widely regarded as DC's worst comic over the past three years), Batman: Assault on Arkham is something of a mixed bag. The character designs are drab, the character interactions are particularly one-note, and the logic of the script is rather weak (sending Task Force X into Arkham not to find a dirty bomb but to retrieve a questionable source of information). The straight-to-DVD movie does offer us Kevin Conroy reprising the role as Batman, but the rest of the voice cast, while not awful, is quickly forgettable. 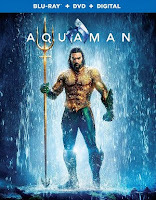 The squad itself is made up of Deadshot (Neal McDonough), Killer Frost (Jennifer Hale), the least impressive version of King Shark possible (wasting the talents of John DiMaggio), a particularly slutty Harley Quinn (Hynden Walch), the argumentative Captain Boomerang (Greg Ellis), the rather nondescript Black Spider (Giancarlo Esposito), and the quickly-dispatched KGBeast (Nolan North) whose unfortunate early exit is rather disappointing. 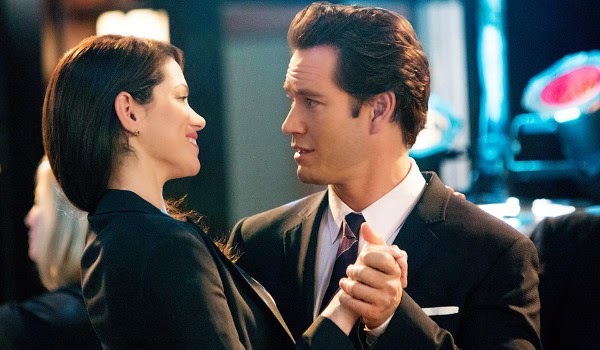 When Peter (Mark-Paul Gosselaar) is approached by an old high school crush (Traci Dinwiddie) in need, Franklin (Breckin Meyer) and Bash agree to defend the woman's son (Devon Werkheiser) who is being threatened with expulsion given his recent article in the school paper suggesting the tampering of the prom queen vote. 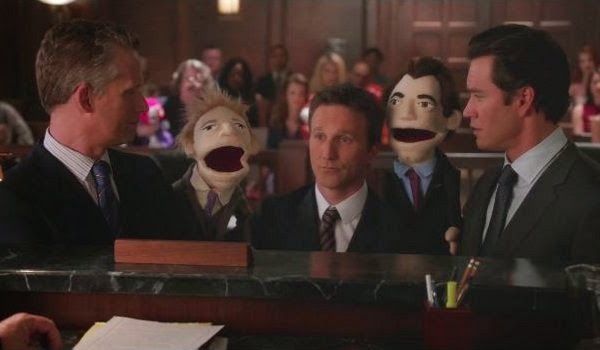 With the young man unwilling to retract the story or reveal his source Franklin and Bash are forced to think outside of the box to discover the truth, save the kid's scholarship, and keep him out of jail for contempt of court. 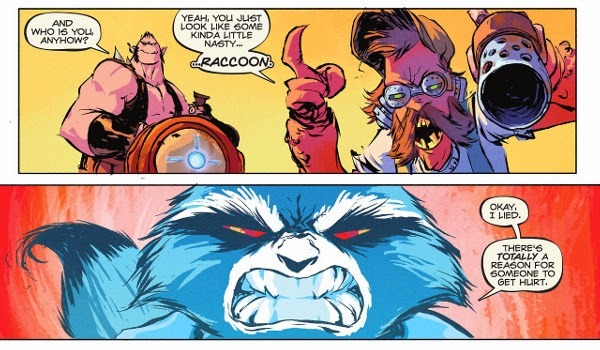 After breaking out of prison and surviving a murderous armada made up of dozens of Rocket Racoon's pissed-off ex-girlfriends, Rocket, Groot, and their friend/hostage take a bizarre trip to Sendak and Funtzel's Intergalactic Towing and Recovery Service (of course that's after Rocket goes super-violent on a couple of amateurs foolish enough to refer to him as a "raccoon"). Building on the groundwork laid in Season Two, the Third Season of Person of Interest brought big changes to the show including the building of a second Machine, the involvement of a terrorist group intent on destroying the Machine, bringing back Shaw (Sarah Shahi) and Root (Amy Acker) - this time as series regulars, and, in a pivotal episode of the season, featuring the death of an important member of the original cast which would leave the team reeling. 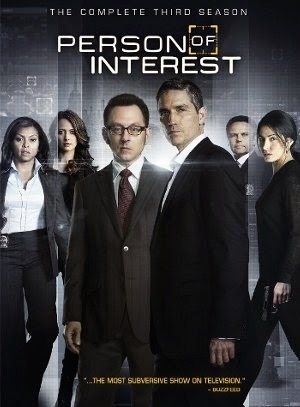 Highlights of the season include Reese (Jim Caviezel) and Finch (Michael Emerson) forced to choose between The Machine and the life of a Senator (John Doman), Root's investigations into Decima Technologies, Shaw and Root's first partnership, the return of Finch's fiance (Carrie Preston), a high school reunion, a flashback episode before Finch and Reese met, a two-part episode involving Finch's old friend old friend (Saul Rubinek) and Control's (Camryn Manheim) attempt to create her own Machine, the final battle with HR, a girls night out, and death at 40,000 feet. 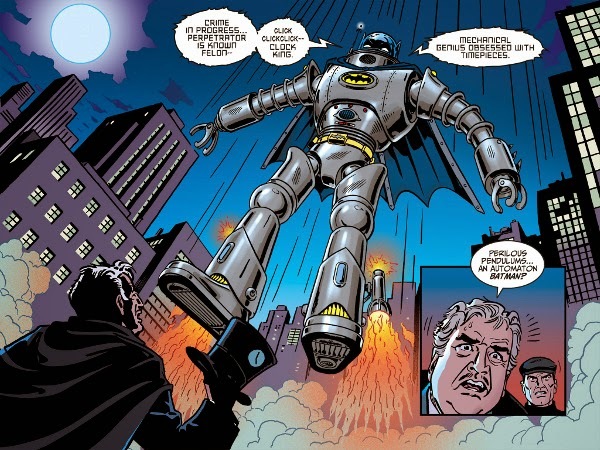 Although he never actually appeared on the 60s television show, there's little doubt such a creation like the Batrobot (which we've seen in various forms over the years in different media such as most recently in Batman: The Brave and the Bold) would be right at home in the campy confines of this version of Gotham City. After teasing us with, but largely ignoring, the truth about Martin Odum (Sean Bean) for the show's first few episodes in favor of FBI missions used to demonstrate both Martin's unique skill-set and his mental state, "Rogue" finally begins to put the mystery of who Martin Odum really is front and center. Beginning with telling off his shrink (Linda Park) and enlisting the help of Maggie (Tina Majorino) to lead him to not one but two other members (Blake Robbins, Kirk Acevedo) of a secret American battalion which he may have been part of back in February of 2004, Odum goes off the reservation and assumes one of his legends in order to get some answers. Finding himself sent back in time to 1930s New York after his encounter with an ancient artifact, Hunter Rose makes the best of the situation by using his well-honed skills and knowledge of the future to go about carving out a new empire in the name of Grendel during the waning days of prohibition. Another DC Nation short, this one featuring the Creature Commandos. Seeing Captain America: The Winter Soldier in the theaters my initial reaction was that the Captain America: The First Avenger sequel was an improvement over the first film and one of Marvel Studio's best efforts. I'm happy to say the movie holds up on Blu-ray. I actually enjoyed it a little more the second time around. 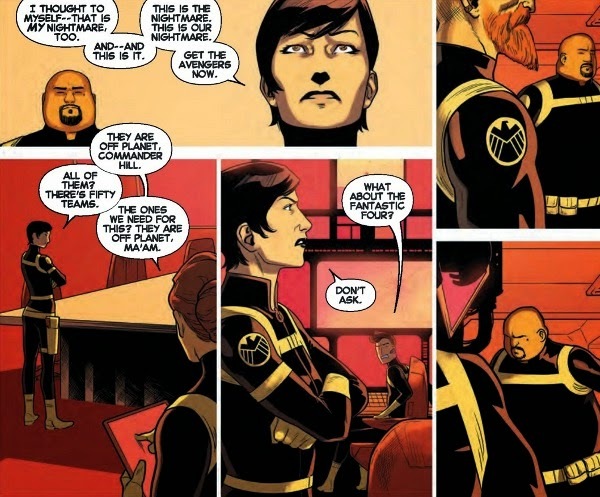 The wide sweeping conspiracy of Hyrda begins sweeping changes in the overall Marvel Universe, immediately effecting Marvel's Agents of S.H.I.E.L.D. 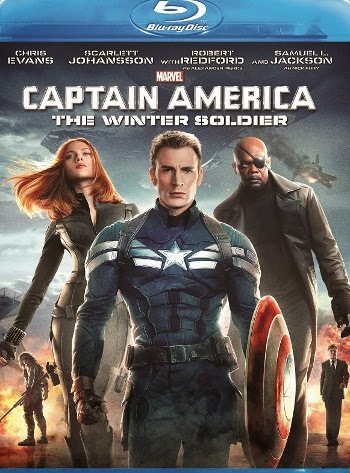 (leading to the TV show's strongest episodes), but more than that The Winter Soldier is a good Captain America story full of strong performances (making great use of Scarlett Johansson as the Black Widow) along with plenty of intrigue and action. Sure the movie wastes Sharon Carter (Emily VanCamp) and the final battle feels a bit too much like a video game with infiltrating and swapping out the chips in hovercrafts of death, but those don't detract from a strong storyline filled with plenty of comic book goodness. For more on the movie read my original review. Superman's joy over reuniting Ulysses with his parents is short lived when the two orphans find themselves battling the man behind the recent attacks on Metropolis. First The Machinist manages to take control over Ulysses pitting him against his new best bud, but the tragedy for the Man of Steel comes later when his new friend takes deadly action to stop the madman which only leaves an innocent dead. Well, I guess it could have been worse. I mean Ulysses could have completely ignored every other conceivable option and just snapped the guy's neck. Right?